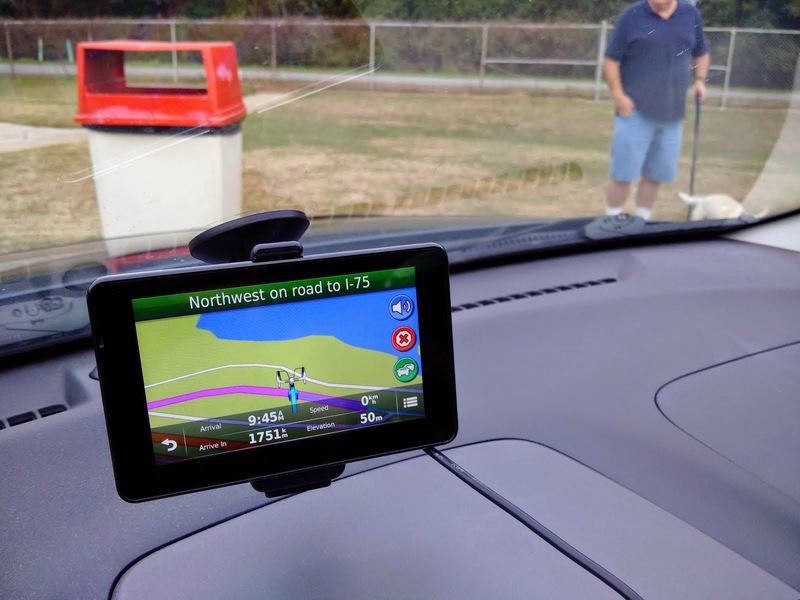 ‎I've evolved a bit of a strange habit: whenever we're driving somewhere far away: I like to take a photo of the nav unit whenever we've parked. I'll grab reference shots before we hit the road, and then at each rest stop until we reach our destination. It's partly driven by my inner data geek, as every picture is precisely time-stamped and, assuming I turn the geolocation feature on, location-aware, as well. The numbers can paint a fascinating picture of a long drive that would otherwise be lost to time. The pictures themselves are rather repetitive and uninteresting, a seemingly never-ending stack of pictures of my GPS unit (her name is Lucille, by the way), the dashboard, and a gauzy view of some forgettable place outside the window. Still, I find these pictures fascinating because they take me right back to a particular time and place, and they allow my mind to linger there for a bit, the perfect mini-break from the chaos of the here and now. This one's one of my faves. We were on our way home on the I-75 earlier this month, and had just crossed from Florida into Georgia. We pulled into the welcome centre to stretch our legs, and happened to pull into a spot beside another vehicle from Ontario. The owners dutifully wandered back and forth with their dog - so cute - and I quietly commended them for having the courage to drive thousands of kilometres with a dog in the vehicle. As Debbie and the kids went inside, I spotted the license plate surround on their Chevy Traverse: they were from London, too. I said nothing because it just seemed weird to walk up to complete strangers and spring the hey-we're-also-from-London line on them. I'm an introvert at heart, and it made more sense to tuck the moment away in the back of my mind. As I lined up the requisite GPS/reference shot with my smartphone, I failed to notice the owner and his dog wandering into the frame. Fatigue: bad, apparently. Looking back at this shot now, I find it poignantly amusing that these wayward strangers-and-kindred-spirits‎ were somehow preserved in pixels, in a moment in time I hope they remember as fondly as I do. Funny how one picture can spawn experiences like this, isn't it?